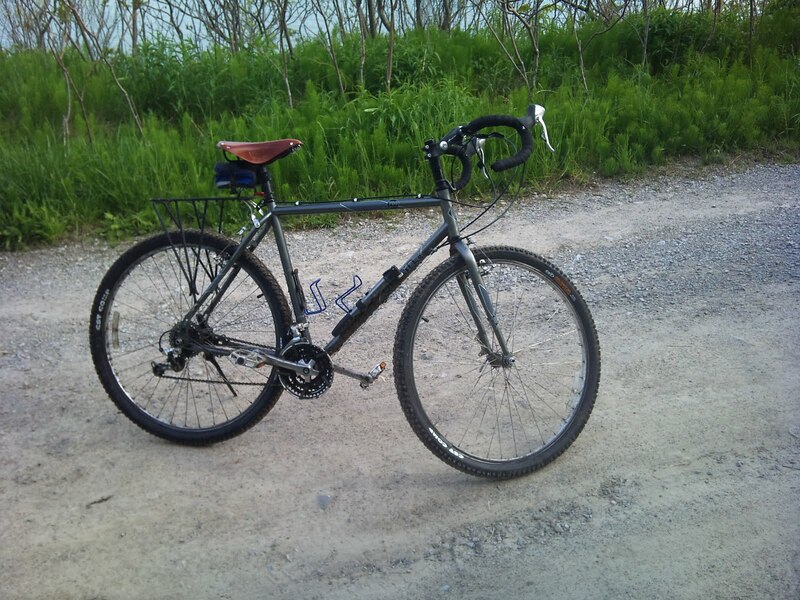 I wanted to see how fast this bicycle would go when it had on more road-oriented tyres, so I pulled off the hulking CST Critters and pumped up my discount Nashbar buys – the now-discontinued “Transition” line of tyres. They are basic commuter/ touring tyres, with a 35mm tread. I picked them up after I had a terrible streak of annoying tire flats on crummy $5 rubber. These Nashbar models feature a layer of kevlar protection, just under the tread; it works – no flats to date, and these year-olds have been tried on >350kms of glass-covered city streets. I give the thumbs up to Nashbar for this one, but I have a sneaking suspicion these are re-branded Panaracer models (if one looks carefully, it has a “Panasonic” hidden on it). Anyway, they are a ton faster than any bulbous mountain tire could be, as anyone should expect. I’d say average rolling resistance for its width, due to the circular dots used for the tread. If it had a directional tread, I would expect less resistance, but I’m not complaining for $7.50 + S&H. Frame of reference: compared to 35mm Vittoria Randonneurs (on my dad’s bike), they are a little softer @ the same PSI, offer more cushion and are more gravel-road worthy, but are noisier, and roll slower. 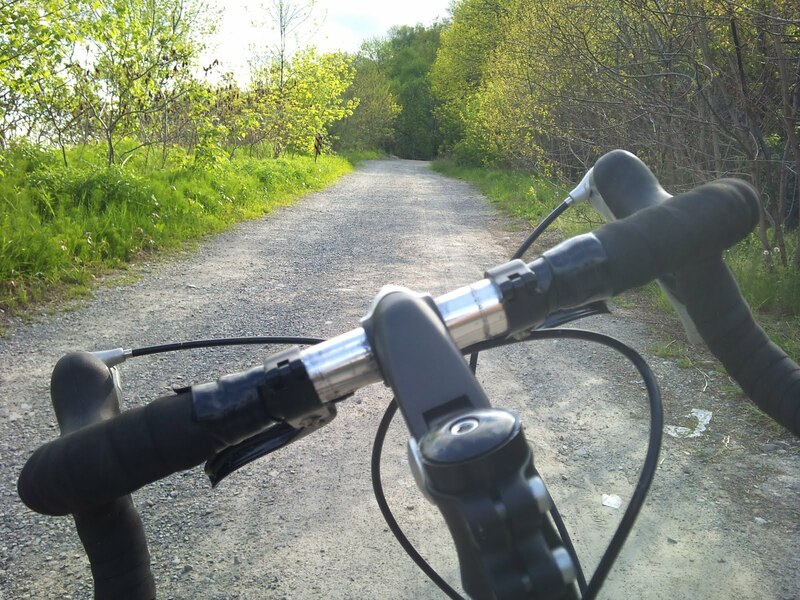 My Rating: Definitely worth it – good tires for a commuting, touring or general road set-up, with superb (kevlar) puncture protection, and which can also take light dirt and gravel trails. However, what you are seeing in the pictures are not Nashbar tires – that funny candycane red tire on the white deep-vee rim is a Hutchinson Nitro 23mm race tire, à la fixed gear. 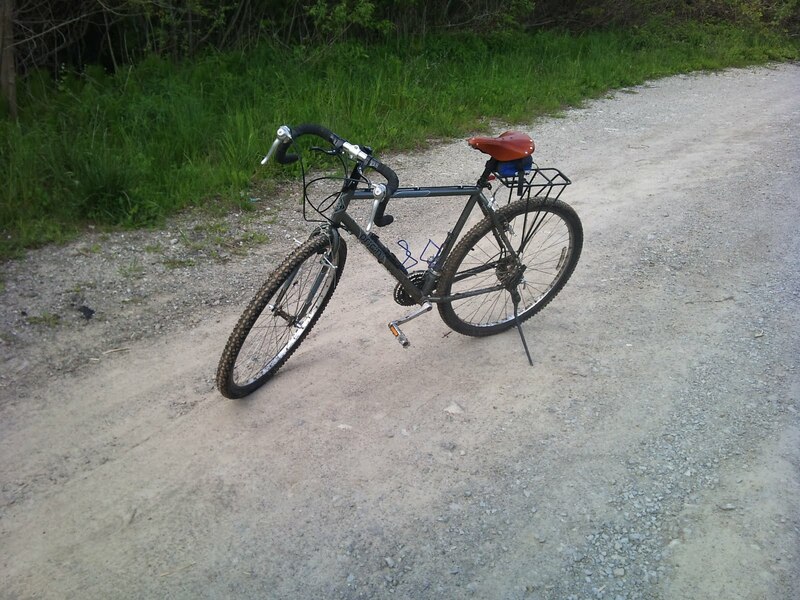 That is, the whole front wheel/tire combo was snatched from my Fixed/SS bike. The rim is Weinmann, and as such, is spectacularly heavy – something like 700g a rim. But the formula sealed hubs are nice, and the Nitros roll easily enough to make the weight penalty negligible. I simply decided to see what it would be like to ride “roadie” for a day, and so switched the wheel; I like it a lot, and it makes the bike’s additional tread clearance look almost comically large. 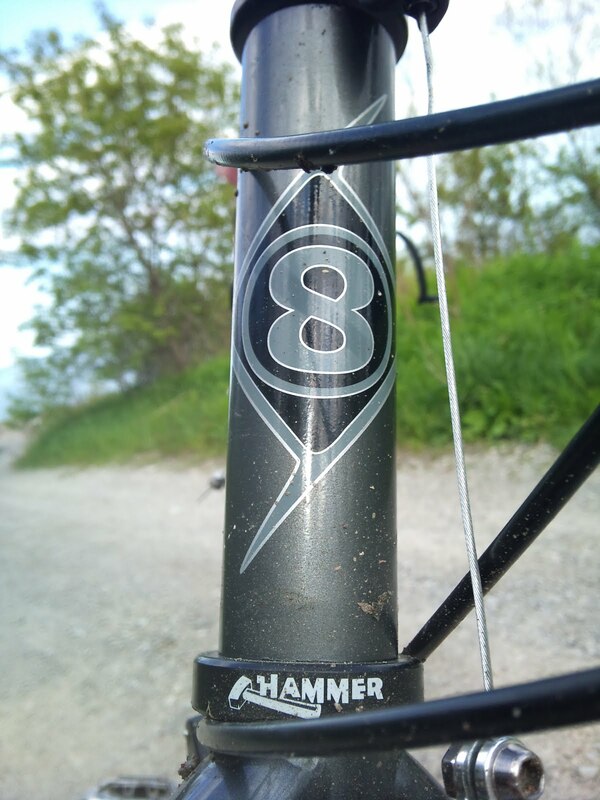 Although the tires are very stiff, the deep-v rims even stiffer, and one would assume that a straight (not curved) fork w/ disc tabs would be too, the ride quality of the O8 frame is good. 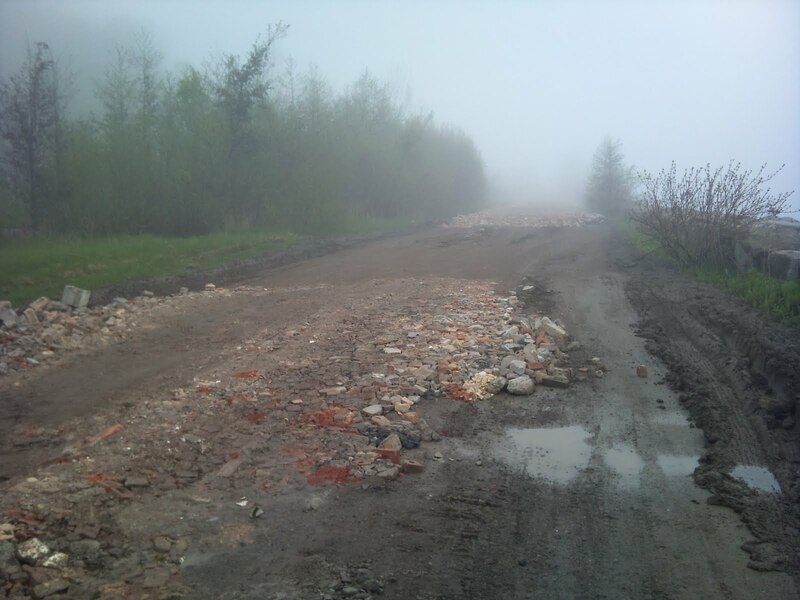 Road noise is what I’d call average, but small bumps, cracks and ‘blips’ in the road are absorbed by the well-designed frame/fork combo. My Rating: Thumbs up for a road-oriented set-up with this bike frame. Oh, and you may have noticed the new (old!) front rack I’ve added – more about that next post! All is well on the bike front, and I’ve now made it up to the 200km mark. I know, not a lot of riding in three weeks, but I’ve been completing the final push of school into exams (I finished my Chemistry exam today, yay! Only physics left, which is tomorrow). 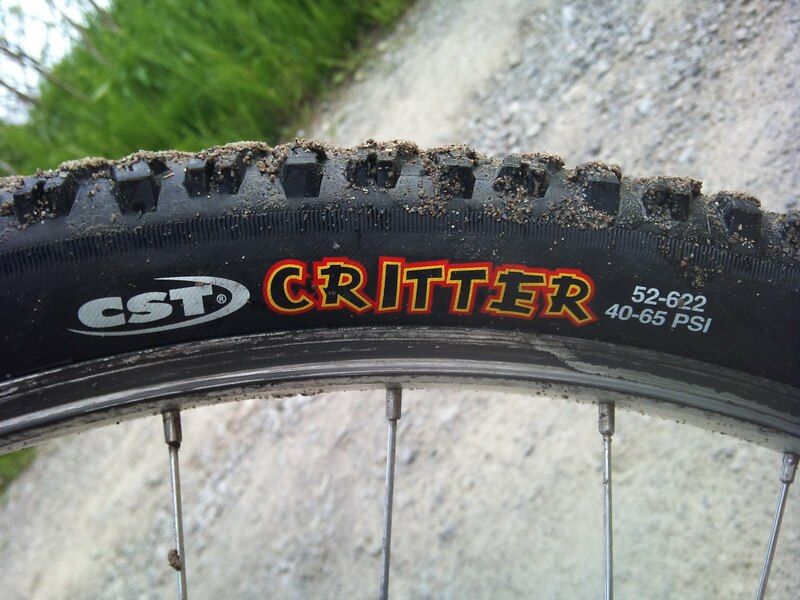 The tires are wearing well enough, but the compound of the CST Critters is fairly soft, so even gravel skids have worn the rear tread down a *weensy bit*. Just enough so that the “herringbone” pattern imprinted on each of the knobs is barely visible. the skid spots are worse than the above picture. 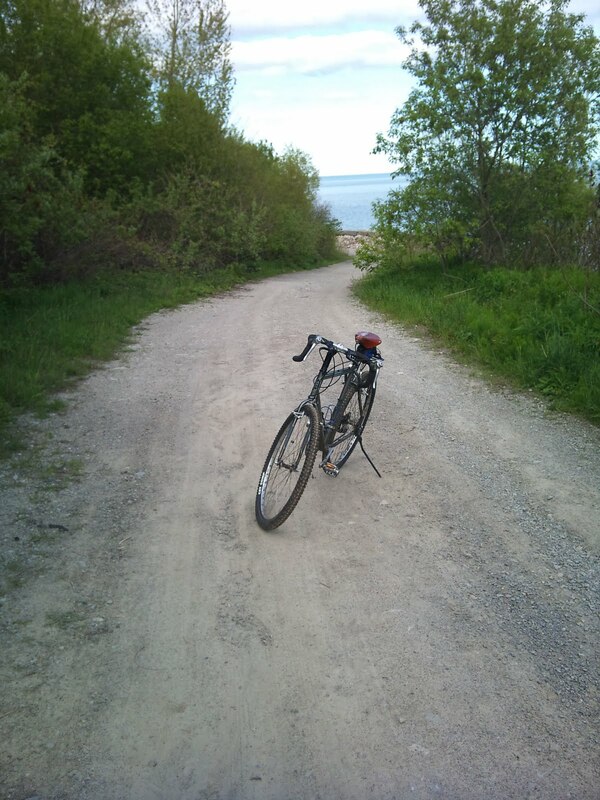 After about 125km offroad (light trails, gravel, a bit of chip seal road and a few muddy+technical bits of singletrack), I’m happy with how well the bike works. Lots of BB clearance for the roots/logs. The CST Critter’s are claimed at 2.1″ wide, but they are closer to 2.0″, in actuality. As many other tires are over-stated for width (see some tire specs here), you could fit a 29 x 2.3″ tire, if you want to really squeeze some large rubber in there. On road, the Critters sap energy, unless they are pumped up to their 65 psi limit. At this pressure, the small contact patch makes it pretty easy to stay going fast. 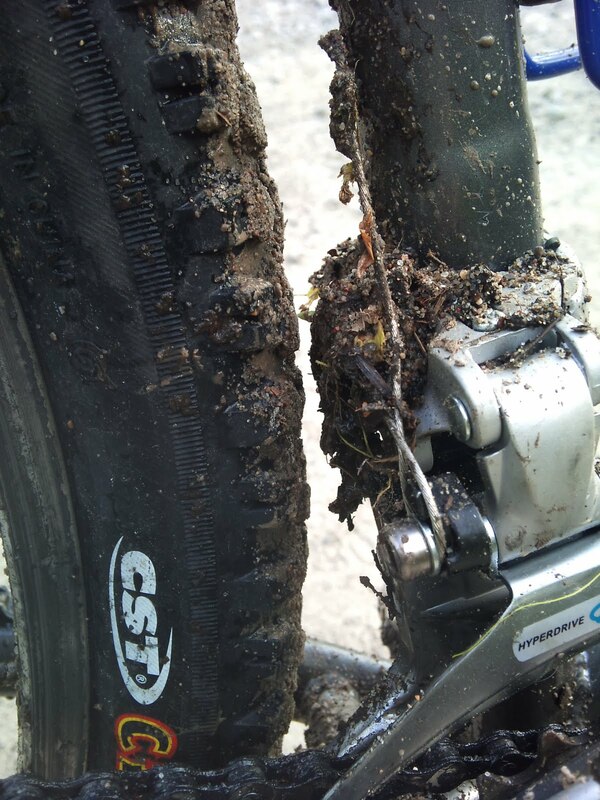 Below 40 psi, the tire makes a great shock absorber for trails. Exceeding the reccomended limit is sometimes reccommended. The frame nice dimensions to it, and the top tube is perfectly sized out so that the handlebars are not too far away for riding in the drops, and not too close to ride upright in the hoods or using the flat part of the bar. This upright riding is a lifesaver for quick downhill switchbacks & fast offroad turns, as well as getting over roots + rocks. An all-around nice ride quality and comfort. it allows adjustment for offroad/touring/road handlebar heights. economic, and still fairly light, Cro-Mo tubing. 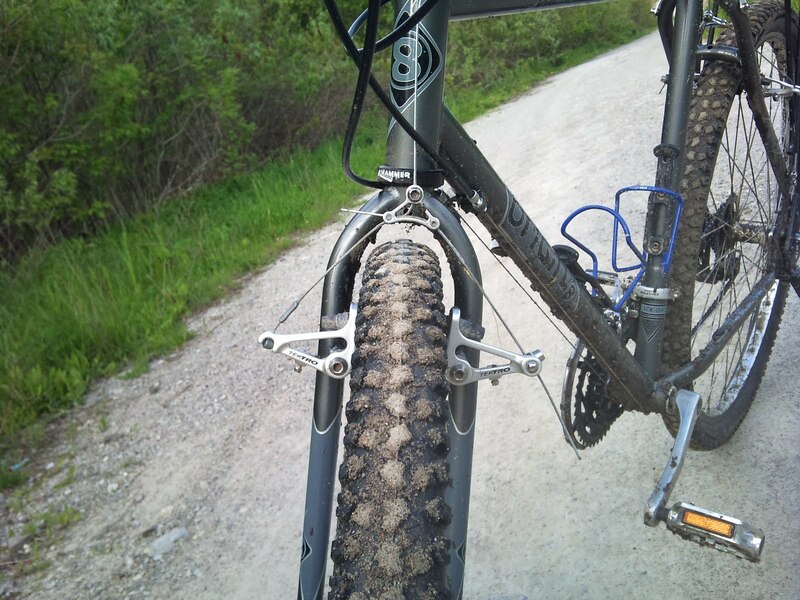 The 17-year-old Alivio rear derailleur is shot, and has so much play that it allows ghost shifting and shifting under load, but won’t shift when the time comes! A well-loved (aka, used) Deore-level or higher mech. 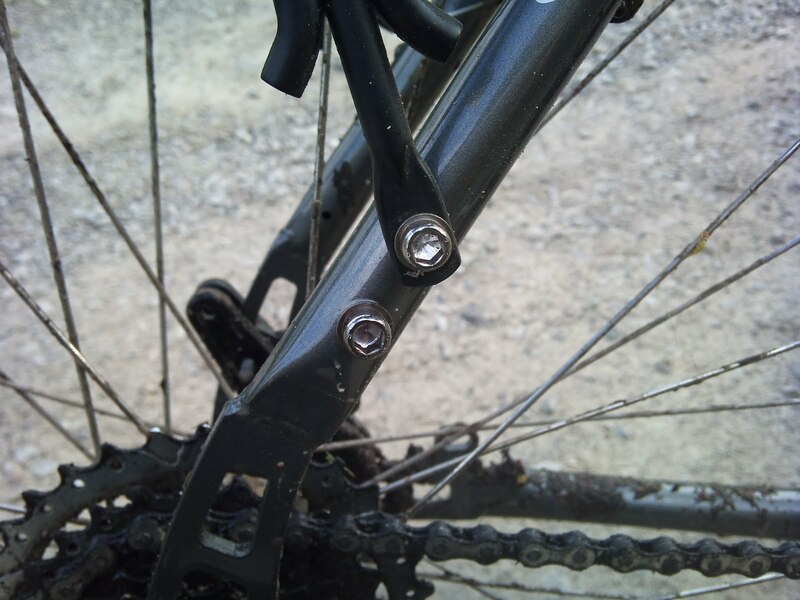 might be finding its way on the back as a replacement – “Bike Pirates” of downtown Toronto has a million of such used derailleurs in a box for dirt cheap. And such good quality derailleurs, if not too badly worn, can be cleaned up and will perform like new. The rear cable stop also poses an odd challenge – it was meant for full-housing cables, so I had to “improvise” with a ziptie, and was placed too far from the derailleur (the cable is almost too short). I need to replace this. The wheel sits slightly too the left in the rear triangle, and I’m fairly sure it is because of the dropouts being misaligned. 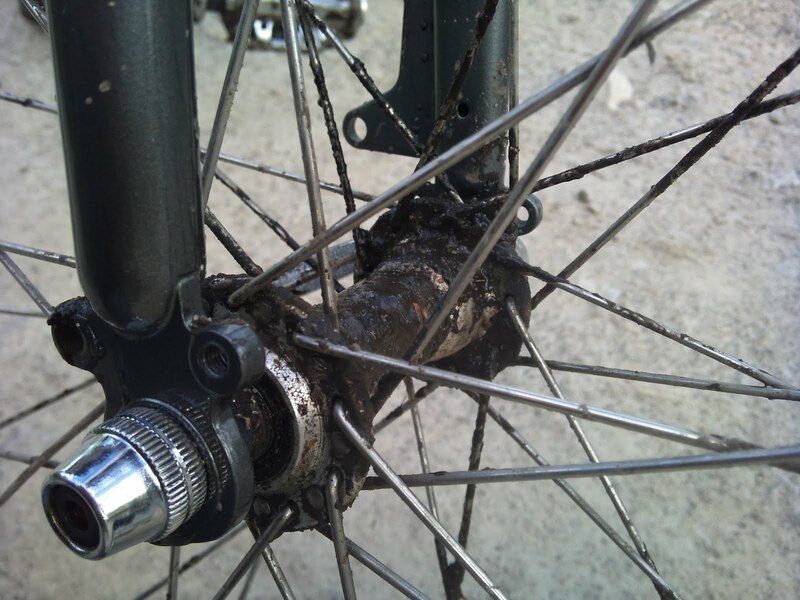 OTOH, it could be because of my 130-spaced hub, as I did add a washer to the left of the hub, and it helped a bit. The high-up rear rack allows lotsa tire+fender room, but it is so close to the seat, that only a few small bits of camp gear could fit atop it. The kickstand is overly bent, and mounts awkwardly on the rear of this new frame, and so a Pletcher 2-legger may be warranted soon, as well. V-brakes or disks manage to have. No regrets, though. Overall impressions bode well, and I think this will stay my primary rig for the foreseeable future. 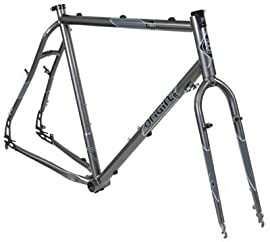 Well, I now have to wait a few weeks longer to get hold of that cx700 frame – a mix up during shipping meant I got the wrong size frame; 50cm as opposed to my order of 56cm. Oh well. Such is life in Moscow. Erm, Toronto. I meant Toronto. I give ‘er the run down when that frame arrives. Wish me luck! – 2.1 in tyres in 700c size – this is what I’d be willing to call a “29er”! Don’t get me wrong – this is by no means an endorsement/promotion for Origin 8; I just happen to love the idea of a go-anywhere, do-everything frame. This is one of the first frames I’ve seen that can be full touring/cyclocross/road or offroad with just a change of tyres, other than the Surly Karate Monkey (can be finiggled into “light touring” mode), the Salsa Fargo (an off-road tourer), or the Rawland Drakkar frameset (like a more off-road version of the cx700). The difference between the Origin 8 offering and the others is the price; it retails for US $200 at most places, compared with $575 for the Surly frame, ~$650 for the Drakkar and over $1000 for the Fargo. I’m a cheapie, so I’m in love with this cheap frame! I screwed myself up and bit the bullet – I bought the frame from Amazon, on sale @ $165 US. I really want a new frame, for my current touring set-up limits me to under 44mm tyres (1.6 inches), and the Plain Gauge Cro-Mo frame (though strong as anything!) weighs in like a brick. Shipping to Canada is gonna be a bit of a hassle, however, so ~$250 shipped, frame and fork, sounds appropriate. Still, a good lot better than any frames I’ve spied at the local LBS’s!